The wonderful librarian at Monash University’s Rare Books (Stephen Perrin) has shared with me just a few of the many ‘John Mystery’ publications in the collection. 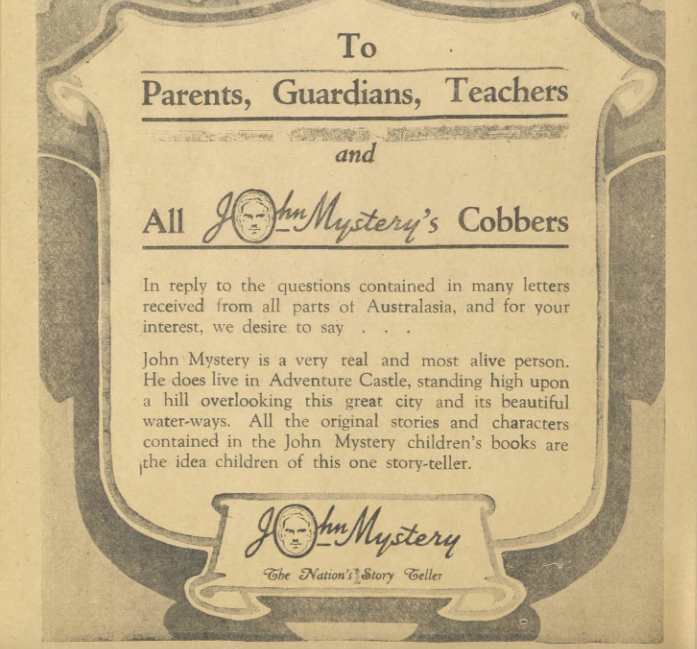 John Mystery was an Australian children’s publishing phenomenon. 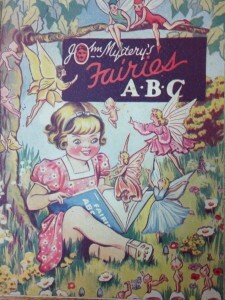 He published hundreds of small, cheap books for children during the late 1930s and 1940s, for very young children (his Fairies and Fairies ABC, for example, are directed at pre-readers), to more complex tales for teen readers, such as the short stories contained in Buried Treasure, including ‘The Death Clock’, ‘Monte Christo’, ‘Aladdin’, ‘Ocean Gold’, ‘The Gold Bug’, ‘Ali Baba and the Forty Thieves’. 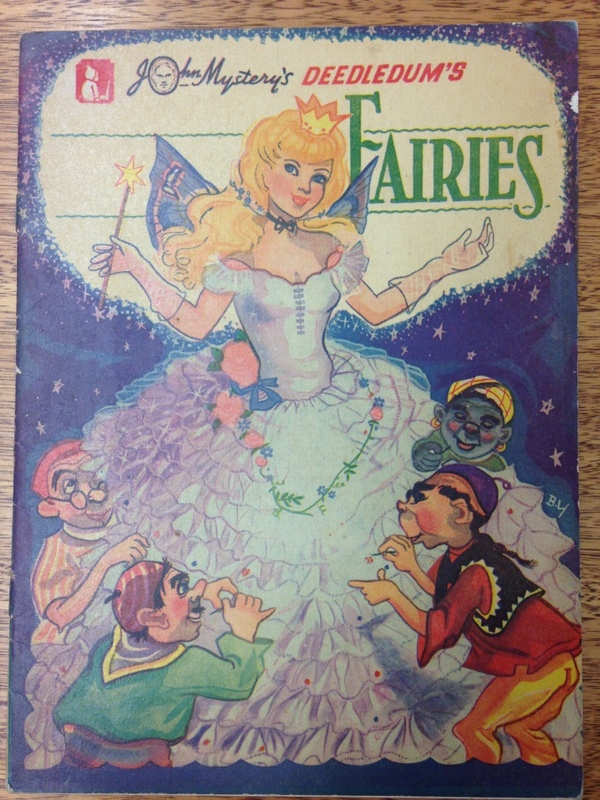 The paper stock is cheap, and the covers flimsy thin card, but the covers are brightly covered, and each publication is packed to the brim with illustrations. Best of all, many issues have a letter from the author to his ‘cobbers’ in the back. These letters address his readers directly, sometimes quote from his fan-mail, and refer to current events (including occasional references to the ongoing war). John Mystery’s ‘Adventure Castle’ in Illawong, NSW. According to the short biography in Austlist, John Mystery was really Lester Basil Sinclair, born in New Zealand, who came to Australia during his teens, and joined the circus (yes, he really did run away to the circus!). He was a soldier at Gallipolli, and wrote a series of war poems and songs, but is most famous for the voluminous output of children’s works he published as ‘John Mystery’. 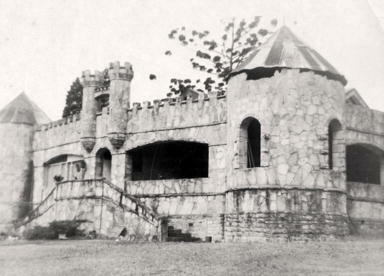 He published out of a ‘castle’ in Sydney (Illawong), which he dubbed ‘Adventure Castle’. His second wife, Ellen Sinclair, was a food writer for the Australian Women’s Weekly, and probably helped out quite a bit with the enormous number of publications that Publicity Press (1938) Pty Ltd published. Monash University have about 140 of John Mystery’s publications in their collection: he published many more, but they are highly ephemeral things. Many of them little more than over-sized chapbooks. Thank you for asking again and again for my books. If the book you want is not at your shop to-day, it may be there to-morrow. Soon, when the final Victory has been gained, and the dream of peace is a dream no longer, I will be able to write all the books for which you have asked. Until then–please keep enquiring at your book shop for the John Mystery book you want. And now–to my new cobbers! Please, when you write to me, enclose a stamped, addressed envelope, and I would like to have a photograph of you, too, to put in my Giant Album. Don’t forget to remind me to send you five of the Lucky Beans from Jack’s Beanstalk, which I discovered in an old oak chest in my Castle. It is said they will help to bring you all kinds of Good Luck! I shall be looking for your letters! That’s all you need to put! 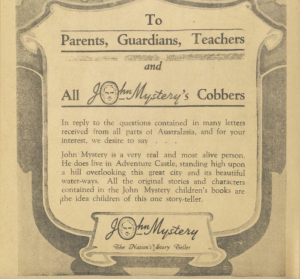 Derrick Moor’s ‘John Mystery: The Nation’s Storyteller’ which appeared in La Trobe Library Journal, Spring Number 60. 1997: pp. 31-39. Also, if you have access to it, Austlit have a fully digitised copy of John Mystery’s Buried Treasure. Quite an amazing man. I am his grandson, Warren Sinclair. Not all the info above is correct. I often wonder about the "John Mystery" pen name as Dads nickname was John and Lester was parted from dad when dad was six years old, never to see his father again. Hi Warren! I'd love to know which details aren't correct--I had some trouble finding much information. That's so fascinating about the possibilities of his pen name's inspiration. What a sad story. 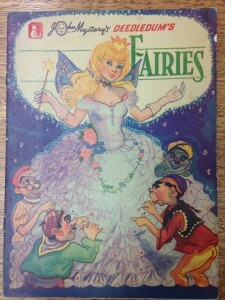 None of the John Mystery series is dated and illustrators are not always acknowledged. 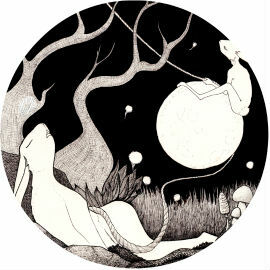 For example, the illustrator Matt Heriot sometimes signs his illustrations as ‘M’ or ‘Matt’, but his contribution otherwise remains unacknowledged. I've not seen much other information published about who the other illustrators might have been, but some of those listed in the Austlit database records for these publications include: J Butler (John Mystery's Big Picture Nursery Rhymes in Glorious Colour), J.L. (Tinies Rhyme Book), and Betty Van Der Pot (John Mystery's Eenie Weenie Winnie Lovely Book of Laughter). I'm sure there are many more! Hi, I would be interested in seeing more photos of Adventure Castle in Illawong. I remember my mother and my elder brother visiting friends at Como on the Georges River. On one visit I was taken to see John Mystery's Castle and this visit has stayed with me all my life. I am now 76. I must have read his books but unfortunately I can't remember any of them. . What a pity. One thing I do remember is we had to visit the friends by boat. The surname was Irwin. Does anyone know of this family of that time? Hi all...and fascinating. Lester Sinclair was my uncle - married my dad's sister - and I have photo of myself at the castle with my mum and a couple of the three great danes, Lester and his wife Ellen (Maud) Sinclair had at the time (1949'ish). I still keep in touch with my cousin John Sinclair (Lester's eldest son), if anyone's interested. 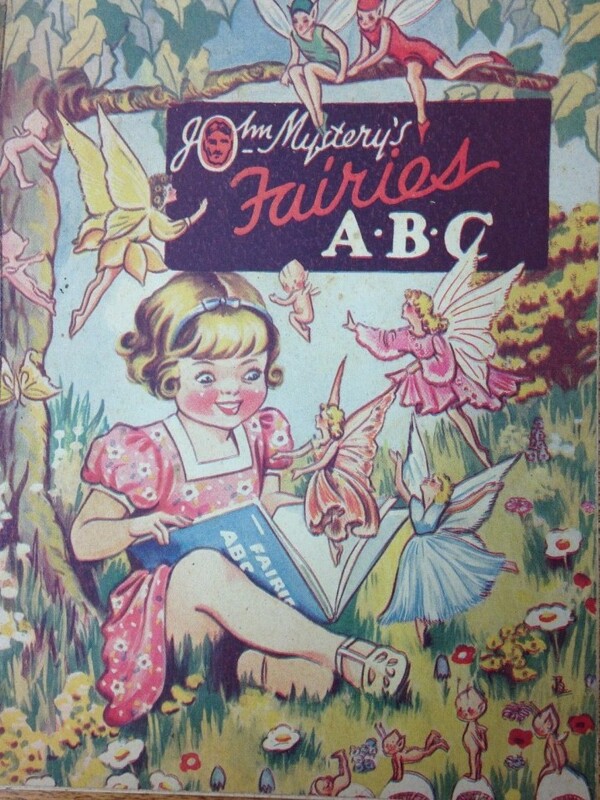 My grandmother Betty van der Pot illustrated a quite a few of the John Mystery series. Sadly we didn't keep all her work. She illustrated a fair bit for Offset printing. How wonderful, Dimity! Lovely to have such a creative family heritage ???? Enter your email address to subscribe to perilous adventures and receive notifications of new posts by email.